Dashboard of Mac OS X is an interesting set of feature which some finds very useful but the others never uses them. The big features are less known to the most. Do not forget that, the Dock and Dashboard are among the features of Mac OS X those has been tried by Windows developers to re-create similar looking application. XWidget is an example of such prototype clone for Windows OS. Funnily, most Windows users are not aware of the fact that, both these Dashboard Widgets and Dock can be used on Windows PC – like Kludget enables Windows users to use all official Widgets of OS X. In this article on Dashboard of Mac OS X, we are writing OS X and Mac OS X alternatively. The reason is, Mac OS X is OS X now, but not all the users are aware of this kind-of rename. Dashboard is a feature in Mac OS X since 10.4 (Tiger). It is also present in Leopard , Snow Leopard as well as Lion. When it is opened in various ways, like swiping with two fingers (gesture) with Apple Magic Mouse or via Dock (if set) or Hot Corner (if set), it is visually on the left side of the “Desktop”, while Notification Center is on the right side. A two finger swipe on the right side of the touchpad (outside to inside) swipes to show the Notification Center (there is also icon to open Dashboard in Mac OS X), while swipe with two fingers towards right on Apple Magic Mouse swipes to show the Dashboard with dotted rubber like sturdy surface. In MacBook Pro, it can be evoked by hitting fn + f12 key. Funnily, Wikipedia wrote about Dashboard in a way as if someone is asked to describe a young lady thinking of a lamp post. On the surface, there are the widgets which can be selected by the user. These have various functions like searching the web, listening to radio, checking local weather, phone book, calendars, sports results, listings RSS, etc. where they number at present to be more than 2000. Dashboard uses many different and varied graphic effects, supposed to make applications more attractive. For example, the opening of a widget (more precisely its drag and drop on the desktop) causing ripples. And search with Dashboard to get developmental information. Go to System Preferences > Mission Control; and uncheck ‘Show Dashboard as a space’ option. Writing more on Dashboard of Mac OS X , will be a guide from an informative article ! Tagged With mac os x dashboard , website on mac dashboard troubleshooting , osx open content in dashboard , os x dashboard , apple dashboard swipe , mac os dashboard birthday widget , how to add reminder in macbook dashboard , fixing macbook dashboard problems OS10 6 8 , dashboard mac , what is open (a webpage) in dshboard Mac os x 10 9 5? This Article Has Been Shared 5935 Times! 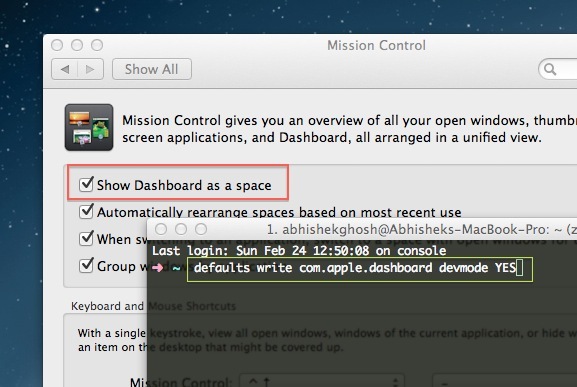 Cite this article as: Abhishek Ghosh, "Dashboard of Mac OS X : Everything About Dashboard," in The Customize Windows, February 24, 2013, April 21, 2019, https://thecustomizewindows.com/2013/02/dashboard-of-mac-os-x-everything-about-dashboard/.